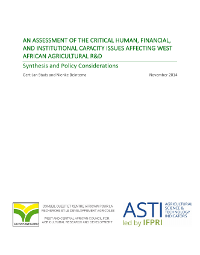 Given the importance of agriculture in West Africa, the Economic Community of West African States (ECOWAS) asked the West and Central African Council for Agricultural Research and Development (CORAF/WECARD) to undertake an in-depth assessment of agricultural research capacity in the region focusing on key institutional, human resource, and financial resource issues. The assessment is a critical input into the development of national and regional agricultural policy recommendations, which will in turn feed into a regional agricultural research strategy for West Africa. To accomplish the assessment, CORAF/WECARD requested the support of the Agricultural Science and Technology Indicators (ASTI) initiative of the International Food Policy Research Institute (IFPRI). ASTI facilitated the assessment in six countries — Benin, Burkina Faso, Ghana, Senegal, Sierra Leone, and Togo — which included a quantitative survey on human and financial resources, R&D infrastructure, and R&D outputs; a series of interviews with selected research and managerial staff; and a staff motivation survey distributed to a selected group of researchers and managerial staff.